milk per ton differences; bringing yield differences into the equation can easily lead to a 9,000+ lb of milk/acre difference among varieties as calculated by the University of Wisconsin Milk 2000 Spreadsheet . information farmers have comes from seed company-generated data. As helpful as that information may be for comparing varieties from within that company, it is not advisable to use intra-company data to compare hybrids from Company A to those of Company B. If the varieties that are being promoted to you are not represented in local land-grant university variety trials in an area similar to your own growing conditions, urge your seed company representatives to get them entered next year. If they do not seem receptive, resolve to do some corn hybrid testing with neighboring farmers, several seed salesmen, and your local Extension agronomist. Poor corn hybrid selection could cost a farmer well over $200/acre if they are selling the crop for cash and much more if they are feeding it to their cows. If you have no local unbiased local data from 2012, another option is to access data coming from areas that have similar environmental factors to your own farm. Extrapolating from trials conducted in other ‘northern tier’ states to your farm should be done with extreme caution. Research conducted by University of Wisconsin and elsewhere demonstrates that forage quality of particular varieties is highly repeatable across different environments, but yield is much more variable. Assessing the yield stability of a variety across environments can be difficult because few individual varieties appear in University variety trials across multiple northern-tier states. The results of the corn variety trials conducted by northern-tier Land-grant universities can be found at their websites: New York, Maine, Michigan, Pennsylvania, Vermont, and Wisconsin (1, 7, 8, 9, 10, 11). The importance of silage quality cannot be over-emphasized. Grain prices are high and this makes dairy farmers and nutritionists more interested than ever in levels of ADF, NDF, NDF digestibility (NDFd), non-structural carbohydrates (NSC), and starch digestibility. Starch digestibility is related to the chemical/physical properties of the kernel. Kernel texture can fall anywhere along the spectrum from easily digested ‘floury endosperm’ to the more difficult to digest vitreous (also known as ‘flinty,’ or ‘glassy’) endosperm. Depending on the time spent in the silo and the degree of processing, pieces of corn from flinty hybrids may pass through in the manure, while the kernels from floury endosperm varieties tend to be digested much more completely. Ask your seed representative if they have data that is helpful for you to evaluate the quality attributes listed above. research done by Heather Darby in Vermont (2010 and 2011) has shown that some BMR varieties are capable of delivering very high yields (3, 4). That being the case, if you want to give BMR a fair shot on your farm, plant some of the best BMR candidates on your best agronomic soils (as opposed to that gravely hill back in the woods that can’t be seen from the road). In general, BMR varieties seem to be much less forgiving of sub-optimal soil conditions than non-BMR varieties. In poor agronomic soils conditions, it is not uncommon to see stunted BMR corn plants that are in various stages of lodging. Avoid extremes and incorporate diversity. Long-maturity hybrids might give bunker-busting yields one year, and disappoint you for several years after that. Research done in Minnesota (see especially figures 7 through 9) and Vermont has shown that shorter maturity hybrids often give yields as good or better than longer-day varieties (2, 5). A corollary benefit is that earlier hybrids are ready to harvest earlier, which has added benefits for spreading manure, planting cover crops, reducing soil compaction, scheduling the custom harvester, etc. You do not need to plant the longest-day varieties to optimize your yield. 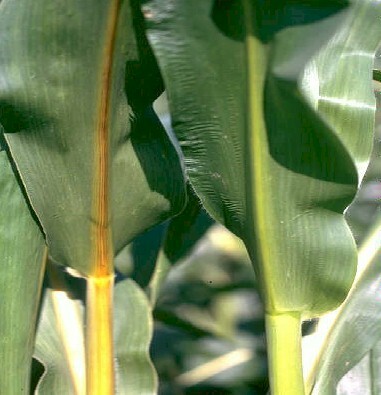 Yield and quality risk can also be reduced by planting several different corn silage varieties even if you happen to have fairly uniform growing conditions among your fields. Different varieties will move through critical stages of development at different times. Adverse weather during a particular week might severely reduce pollination success in one variety, but it is much less likely to have the same impact on three or four varieties. What about disease and insect resistance? If you are in an area with northern corn leaf blight or other disease pressures, selecting a resistant variety is extremely important. For those who have had challenges with fall armyworms and expect the same in the future, selecting a variety with an appropriate Bt trait is important (6). One of the challenges in the Northeast is the extreme variability of growing conditions from one area to the next. We have upland areas, river-bottom soils, mountain aspect considerations, and a wide range of soil types. Diverse geographical features also make temperature, cloud-cover, and precipitation patterns highly variable across the region. This variability may require a more diverse set of hybrids than one farmer prefers to deal with, but matching varieties to conditions is extremely important and one more reason to experiment with different varieties on the different soils on your farm. Many farmers will not have the benefit of local University-run corn silage variety trials in their specific location or environment next year. In this case, resolve now to work with your local Extension agronomist, seed company representatives, and neighboring farmers to establish a small-scale variety trial on your own farm. Establishing, maintaining, and collecting data from these plots can be accomplished with surprising efficiency, but plots need to be established properly in order for the data to be meaningful.